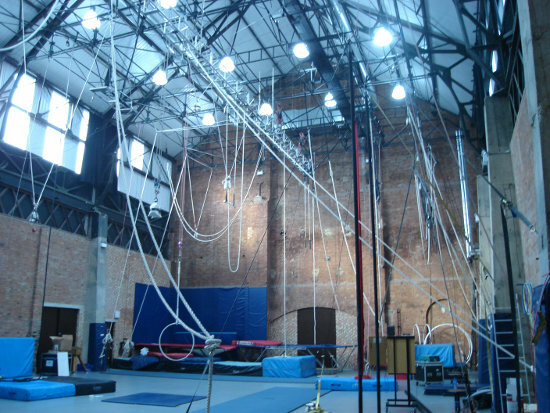 One of two accredited circus universities in the UK, Circus Space is a highly developed custom facility built into an old Victorian power station in Shoreditch, London. They've got a bunch of different spaces, ranging from the huge Combustion Chamber (pictured; 9.5m) to the slightly less huge Generating Chamber (7.5m) to a series of studios of various sizes. To train independently you have to be an ACDC (Artist & Company Development Center) member, which means going through an induction and meeting Circus Space's criteria – you have to be a professional artist and be 'working in line with Circus Space's artistic vision'. There's a guest membership available for up to seven days, under which training is £10 p/d; if you're a permanent member then price will range from £2.67 to £6.50 p/d. The schedule for ACDC training is fitted around Circus Space's other numerous commitments, and days/times change from week to week. In London, an under-spaced city, The Hangar is a little more relaxed and available, but further out.